Mellow yellow: This celebrity-favorite style features our ultraviolet yellow lens (a yellow tint with a flash mirrored blue coating) in a matte silver metal frame. Temple tips and nose pads are matte white rubber. Genuine carbon fiber side inlays in a white and silver weave complete the futuristic look. Set phasers to Stun: Stun frames feature a one-piece shield lens in shatterproof nylon with 100% UV protection. 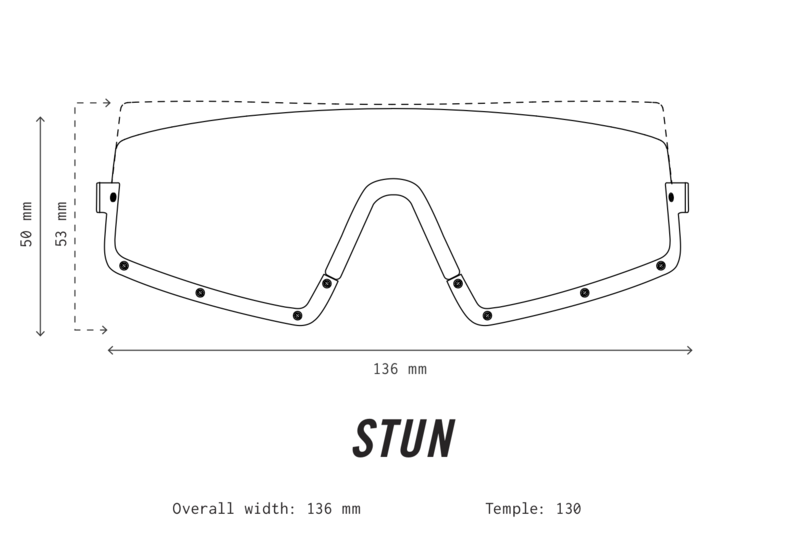 Its aerodynamic shape and rimless design make this the perfect sunglass for biking or running. The lens features anti-scratch, anti-sweat (hydrophobic), fingerprint-resistant (oleophobic), and backside anti-reflective coatings. The lightweight frame is constructed of surgical-grade stainless steel, with the smoothest, most durable hinges on the market. All touch points (nose pads, temple tips) are soft touch for comfort, and highly adjustable for the perfect fit.